Helen Herron Taft had two passions in her life. First and foremost was politics. Then came music. One of the earliest photographs of Helen Herron, called Nellie from birth. Piano lessons was practically a given in most nineteenth century middle-class families. Of course, then as now, not all children were musically inclined – or interested. Helen Herron Taft (Nellie from birth), of Cincinnati, Ohio, was one of those little girls with some noticeable talents – and interest, but it became obvious that while she played nicely, she was not a Clara Schumann. So she focused on playing her best, enjoying music sincerely, and channeling her passion for politics. The passion for politics surfaced when she was fifteen, and then-Governor Rutherford B. Hayes was elected Republican President. An Ohioan like her own family, Hayes was also a law partner and good friend of her father. Nellie’s social-climbing mother was also a good friend of Lucy Hayes. Thus when the Hayes went to live in the White House, the Herrons were invited to visit for a week or so. Nellie was enchanted. And determined to “reign” in the White House herself one day. She announced to her father that she wanted to go to law school and be a lawyer like him. He replied gently that he had no doubt that she would excel in her studies, but she would never be able to earn a living. Then he continued, stating that she would need to make a living, since no man would want to marry a woman lawyer. He had a point. Then. So Nellie focused her energies on marrying a man who would be her vehicle to the White House. She found one in William Howard Taft, a big teddy-bear of a fellow with a distinguished legal pedigree, Yale education, and the stuff that would get him ahead. When the Tafts married in 1886, it fell to Nellie to channel her political drive into her more placid husband. He had discovered the judicial side of the law, and would forever prefer the “bench” to the nitty-gritty of politics. Nellie nitty and grittied with the best of them, made sure she kept up with the see-and-be-seens, who-is-important, what’s-going-ons, and all the other undercurrents of political life. 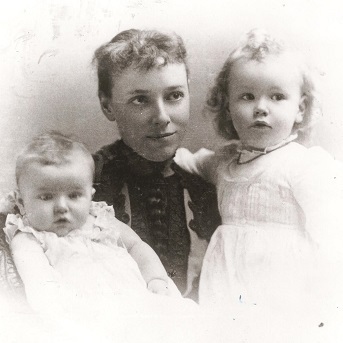 Nellie Taft with baby Helen and toddler Robert, about the time her husband was Solicitor General. When WHT was appointed Solicitor General by President Benjamin Harrison, Nellie was thrilled beyond belief! They would live in Washington, where everything was happening! She packed up the house and their two small children, and left for the capital city with a smile on her face. Four years later, an appreciative but defeated President Harrison appointed Taft as Circuit Judge. It was an important position, and Taft was thrilled. They moved back to Cincinnati. By now, Robert and Helen were old enough to be in school. Nellie Taft (1861-1943) had some time on her hands and needed an outlet. Mrs. Taft liked nothing better than being in the midst of activity. She found her outlet in a small woman’s club devoted to music. Woman’s Clubs had become immensely popular after the Civil War, and ladies from all walks of life were joining eagerly. It afforded them purposes and vehicles to advance their own educations, abilities and interests. Their menfolks were generally approving as well. Woman’s Clubs were devoted to charity. No one could be against charity! Nellie became active in the club, and was soon elected its President. What would be their goal? Cincinnati had been the Queen City of the Midwest for decades – even when Chicago was a small trading post. Their residents were proud of their culture, their educational opportunities, and all the important people who were happy to visit their city. But they did not have a symphony orchestra. Her dedicated hard work for the Cincinnati Symphony Orchestra paid off during her seven years as its driving force. Nellie’s club undertook to remedy that oversight. It was a monumental task, requiring fund-raising, awareness drives, more fund-raising, choosing venues and locations, building a concert hall, still more fund-raising, finding a maestro of reputation, finding musicians of superlative skills, determining a schedule and programs, and on-going fund-raising drives. In short, it was a job for men to manage, but she held that position for seven years. “I found, at last, a practical method for expressing and making use of my love and knowledge of music,” she said. 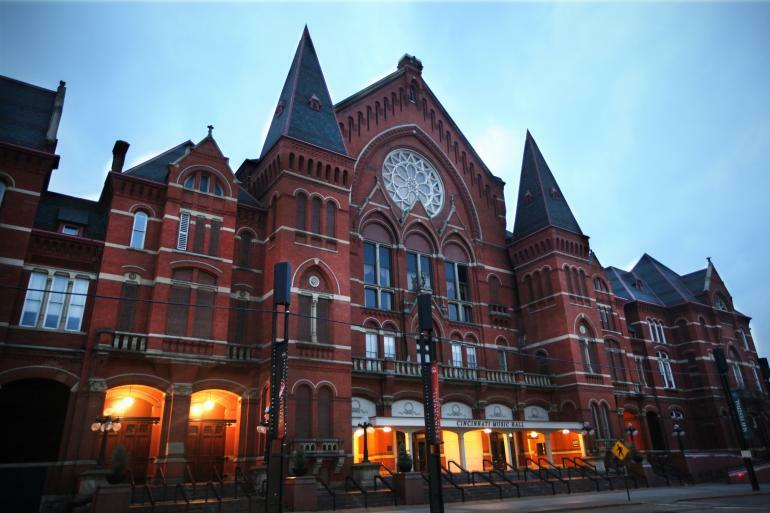 The Cincinnati Music Hall, home of the CSO. Of course she had help, notably the prominent Taft family. WHT’s eldest brother, Charles Phelps Taft, the owner of an important Midwest newspaper, had married the daughter of a bona fide millionaire. Charley and Annie Taft adored Will, and spent their lifetime helping promote his political career. They also understood and admired Will’s ambitious and extremely intelligent wife. The Taft family was happy to sign on as heavy-duty contributors to the CSO from the start. One of the early programs from the CSO – 1895. But while Annie Taft gets the credit for writing large checks (a vital contribution!) it was Nellie Taft who made the contacts, attended meetings, wrote the letters, followed-up on vague commitments and otherwise moved the “idea” of the CSO into actual reality. Becoming pregnant again with the third Taft child notwithstanding, she never let the mundane interfere with the great dreams. Her husband was deeply proud of his wife, and enthusiastic about her project. They had always exchanged daily letters when apart, and his letters to her are filled with his encouragement and pride in her abilities. By the time President McKinley appointed WHT to a diplomatic position in the Philippines, the Cincinnati Symphony Orchestra had become a reality. It still exists today, and is considered one of the finest in the world. This entry was posted in A POTUS-FLOTUS Blog, William Howard Taft and tagged American history, Annie Taft, Charles Phelps Taft, Cincinnati Symphony Orchestra, Feather Schwartz Foster, Federation of Woman's Clubs, First Ladies, First Ladies history, Founding the Cincinnati Symphony Orchestra, Helen Herron Taft, history, Lucy Hayes, Mrs. William Howard Taft, Nellie Taft, President Benjamin Harrison, President Rutherford B. Hayes, President William McKinley, Presidential history, Presidential wives, Rutherford B. Hayes, Solicitor General Taft, the "CSO", The Taft family, US history, White House history, William Howard Taft, Woman's Clubs. Bookmark the permalink.